Welcome to November 2014 issue of GL's Newsletter providing information and insight into our latest product High-Density Call Generator for IP and Wireless Networks - referred to as MAPS™ HD (Message Automation and Protocol Simulation High Density). 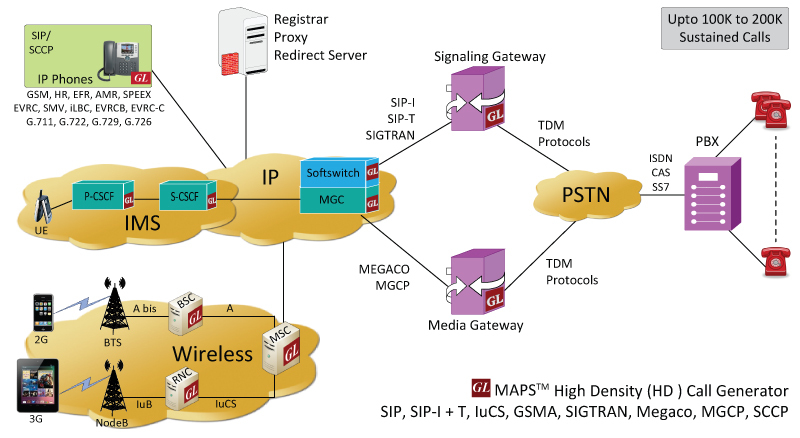 MAPS™ is GL's standard framework for emulation of IP, TDM, and Wireless protocols (see complete list). The HD version is a special purpose 1U hardware platform capable of high call intensity (hundreds of calls/sec) and high volume of sustained calls (tens of thousands of simultaneous calls/1U platform). Multiple 1U platforms can generate and sustain 100,000 to 200,000 calls all controlled from a single Master Controller. GL's MAPS™ HD is a high density multi-protocol, multi-technology network appliance that performs signaling and traffic generation for a vast array of communication protocols covering IP and Wireless networks. It supports simulation of SIP UA, IMS SIP UE, SIP I+T, SIGTRAN, IuCS, MGCP, NCS, H.248/Megaco, Cisco SCCP (Skinny), Clear Channel (No Call Control) and provides non-reference-based voice quality using E-model (R-factor) and MOS with five mapping scales.